Dog food grains. Canine allergies. Could they be related? Well, in a word, maybe. Take bread mold. As unappetizing as it looks, bread mold can seem fairly harmless. Yet mold and other contaminants sometimes found in cereal grains used to make dog food can cause serious illness — even death. Surprisingly, cereal grains can be some of the most problematic ingredients in commercial dog food. Cereal grain leftovers classified as “unfit for human consumption”. And low quality ingredients like these can always be fertile breeding grounds for some of the nastiest contaminants in dog food. Grain infestations are so common that damage done by insects after crops are harvested is sometimes greater than the damage done during the growing season itself2. That’s how the carcasses of dead grain insects can so easily end up in commercial dog food. These common dog food pollutants should be considered prime suspects in any attempt to prevent canine allergies. So, what do you get when you mix a low-quality feed grain with plenty of moisture — and then store them together over time? Mites. Grain mites. And lots of them. This tiny eight-legged creature is a close relative of the dust mite, that infamous household pest that might just be one of the most common causes of allergies in the human population. And can they ever multiply! One female mite alone can lay up to eight hundred eggs in as little as just nine days3. Some of these juvenile mites morph into a stage known as the hypopus. During that phase their bodies harden and the mites develop numerous small suckers on their underbellies. 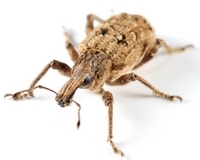 These tiny arthropods then use their suckers to attach themselves to the bodies of grain weevils, beetles and other insects. So, with a little help from their newly-found “friends” they quickly spread throughout an entire bin of feed grain. Within days, the stored commodity can become completely infested with disease-causing grain mites. 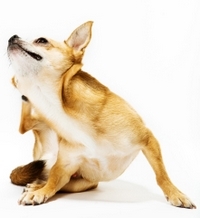 Atopic dermatitis can be an agonizing condition for dogs. It can go completely undiagnosed for years. Yet it is remarkably common. The disease is a chronic and allergic skin reaction to specific pollutants (called allergens) found in a dog’s environment. So, what are these “specific pollutants” that cause this miserable disease? Well, it’s been known for years that atopic dermatitis can be caused by common household dust mites. You know, the kind you find in your home’s carpeting. The same kind of mites that cause allergies in humans. So, could mite-contaminated dog food have anything to do with canine skin allergies? In other words, the consumption of grain storage mites and their carcasses must be considered an important cause of atopic dermatitis in dogs. That finding clearly implicates grain-based dog food as a possible cause for this far-too-common condition. In Part 2, I’ll cover a much more dangerous problem with the grains used to make dog food — deadly toxins.